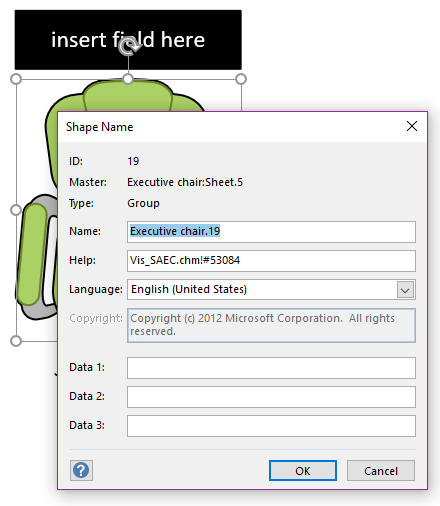 Many Visio users discover how to insert fields into the text of Visio shapes to display data contained in Shape Data fields. But they become frustrated when they add multiple text blocks to grouped shapes, as the process becomes more tricky. Let’s take a look at how to do this! 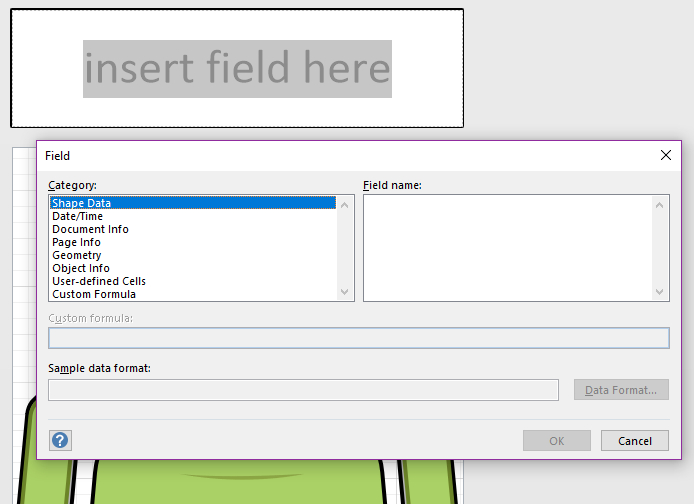 As you may or may not know, you can insert fields into shape text using the Insert Field dialog. With this technique, you can display Shape Data field values in a shape’s text, along with User-defined cells data, or any valid ShapeSheet expression. For this article, we’ll start with the Excecutive chair shape, located on the Shapes > More Shapes > Maps and Floor Plans > Building Plan > Office Furniture stencil. 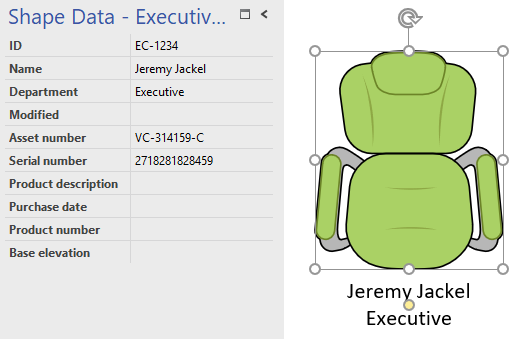 The furniture shapes have been nicely updated in Visio 2016 (or Visio 2013? 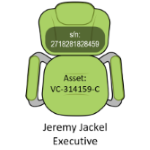 – I need to check), and this one’s a beauty! Below, I’ve don this twice, adding a new line between the two fields I referenced. 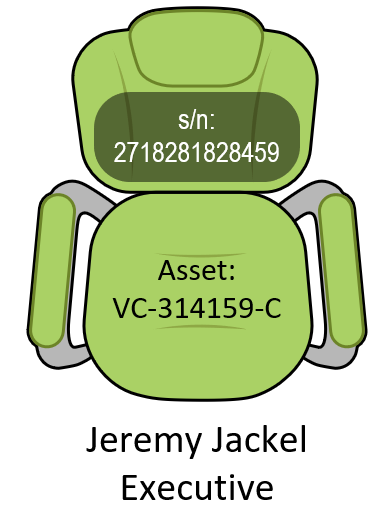 Now our shape shows the Name and Department fields of the shape. Whatever the reason, if you need more than one text block on a shape, then you need to add subshapes within a grouped shape to hold additional text. 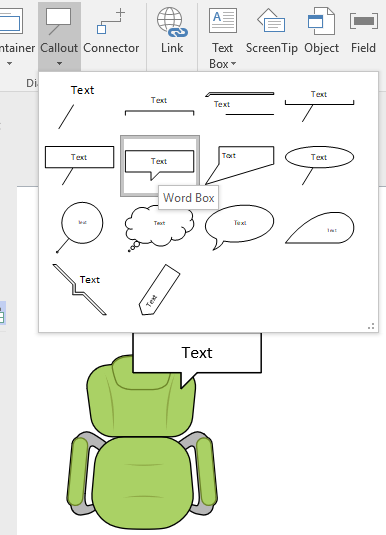 Visio shapes can only have one text block. If you have a grouped shape, then the group has only one text block, but each subshape can also display text. 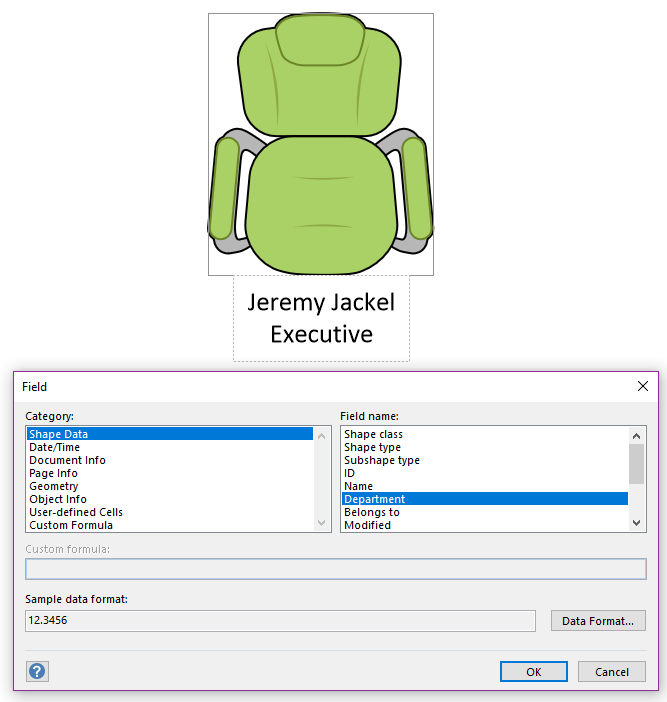 Right-click > Group > Open Executive chair.19 – the underlined portion will change depending on the master your shape came from, and the indexed suffix that Visio appends to it. The group-editing window for the shape will open up. 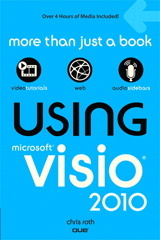 Note the presence of “<GROUP>” in the caption for the window. If your inside-of-Visio windows are maximized, it might look like your drawing window has disappeared, but that’s not the case. Press Ctrl + Shift + F7 to arrange the windows that are open (same command as: View > Window > Arrange All). You should now see your drawing window and group-editing window side-by-side. Where’s the data? 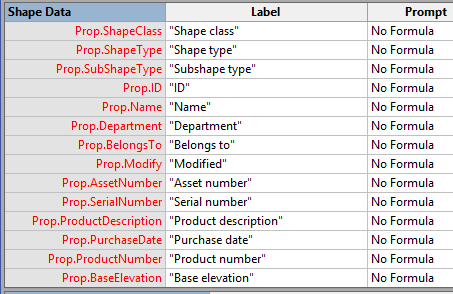 There are no Shape Data fields listed! What are we going to do? 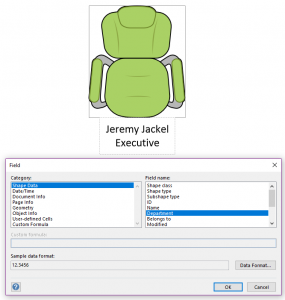 The problem is that Visio is looking at the selected shape to get the offerings of fields to insert. The simple text rectangle that you’ve just drawn has precious little to offer. It’s the group that has all the juicy shape data, and after all these years, Microsoft still hasn’t updated this dialog to make it easy to access the group’s data. 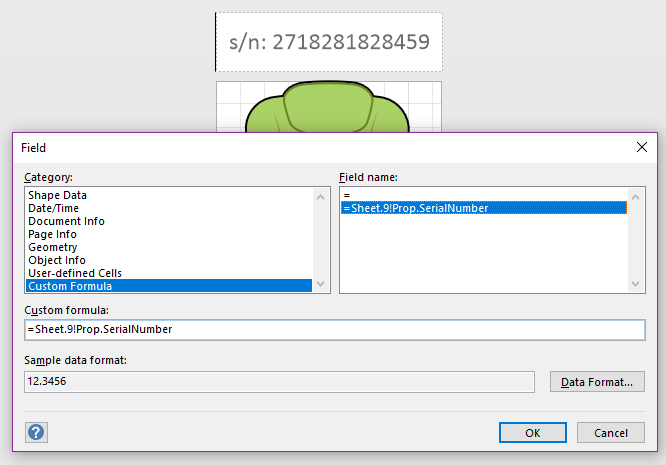 Now I mentioned earlier that you can insert a field that represents any valid ShapeSheet expression, and similar to Excel, Visio’s ShapeSheet can “reach out across boundaries”, so to speak. You can get to the group, but you have to know its ID first. Make sure the Developer tab is turned on. For more details, read:What’s My Shape’s ID? For our example, we can see near the top of the dialog that our group’s id is 19. Now, we can go back to where we were before. Get into the <GROUP> window, select our text subshape, enter text-edit mode, and hit Ctrl + F9. At the bottom of the Category list, we’ll need to select Custom Formula. S h e e t . 1 9 ! P r o p .
Of course, your shape’s id probably won’t be 19. …and that’s fine, as long as you only want to use the default text block of the shape. 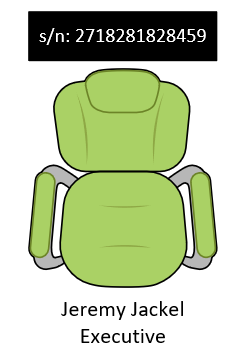 In the case of the chair, this isn’t a terrible thing, as the office furniture has a text block which is easily repositioned using a control handle. You may want to have multiple text blocks on a shape for a myriad of reasons. But if your need is to specifically display shape data, then there may be be alternatives that better suit your needs–especially if you need to view different sets of data at different times. I suspect that a large fraction of cases might be better suited to the methods that follow. where each field that you want to display takes on one of the items listed above. You can define several data graphics for a document, then choose which ones to apply. 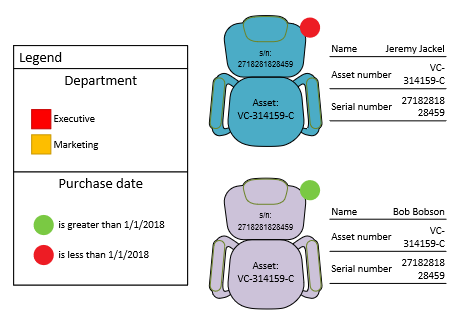 So one data graphic might show asset and serial numbers, while another data graphic would show the name and department associated with the shape. You wouldn’t need to follow all of the customization steps in this article, you just define a data graphic, apply it to a selection of shapes, then change or remove the data graphic as needed. This is great, because you don’t need to alter the structure of your shape at all! 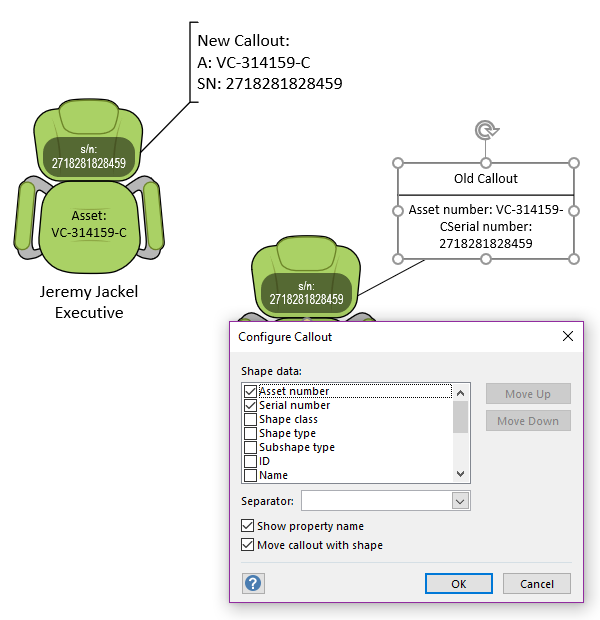 You can also add a callout to any shape on the page via: Insert > Diagram Parts > Callout. 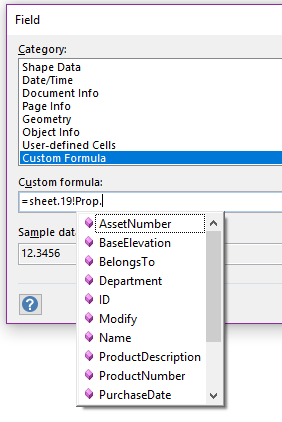 These callouts have no automatic access to the data of the shape that they are pointing to, but now that you know about expressions like Sheet.19!Prop.SerialNumber, you can easily Ctrl + F9 insert a custom formula field into the text of the callout. Callouts are nice in that they can be freely repositioned relative to the shape they are pointing to, but they move with their target shape. In addition, if you copy the target shape, the callout gets copied, and if you delete the target shape, the callout gets deleted. Pretty slick! The nice thing about the old callouts is that they pop up a dialog that let you choose shape data on the target shape (right-click and choose Configure Callout… if you don’t see it on drop). They also automatically insert field labels if you check the box! But unlike built-in callouts, they don’t copy nor delete with the target shape. However you choose to display data on your shapes, I hope it is a lot easier for you now! Unfortunately, all of these are useless because you cannot use those fields to edit the Shape Data. 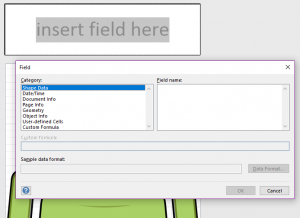 Typing into any of these fields just results in it converting to a regular text field and the shape data will no longer be displayed. I guess that’s why I chose the title “Link Fields to Subshape Text” and not “Link Shape Data Fields to User-typed Text”.